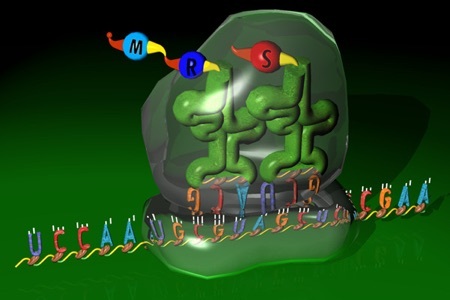 have to do with the processes by which living systems to convert from a language involving self-partnering chemicals–the bases— ideal for copying and dispensing ‘instructions’, to one that constitutes a wondrous diversity of building blocks–the amino acids— from which virtually any cellular machine can be made.. The nature of the pieces #1 (bases): ‘Complementary matchers’ [the bases] that are intrinsically, structurally capable of being copied. No copier required. And if available in duplex format, reproduction is innate in the structure. Wow. The nature of the pieces #2 (amino acids): ‘Building blocks’ [the amino acids], a small number of which constitute a sufficient set of blocks to build… anything. No, really—anything! While I say above that the amino acid structures themselves aren’t a key concept, the diversity represented among them is. To name names, we have a tiny corner-turner (glycine), a fixed angler (proline) a smorgasbord of hydrophobic of various size and flexibility (Ala, Val, Ile, Leu, Met, Phe), some big rings of various properties (Phe, Tyr, Trp, His), a covalent link-maker (Cys), a pH-sensor (His), positive (Lys, Arg) and negative (Glu, Asp) specialists, as well as dedicated H-bonders (Gln, Asn). I think it’s fair to say that none of these individuals is essential in detail; if it’s functionality were achieved through a slightly different structure, all would be well. It’s interesting to point out shortcomings in passing: Cys is the only decent redox player, and nobody has a good metal for a sidechain (think heme in hemoglobin, or the irons and coppers of the electron transport chain). A way to invest sequences made of PIECES(#1) with ‘meaning’ in terms of PIECES(#2). In other words, how do we take ‘meaningless’ but copy-able sequences of nucleic acid and ‘interpret’ them into sequences of amino acids? Initial proposals were that adjacent nucleotides of DNA formed ‘pockets’ for amino acid sidechains; Crick later predicted the existence ‘adaptor molecules’, with key like nucleic acid features, but with amino acids attached. Yes. PREDICTED tRNA. Oh, and in the same paper (actually, an informal letter to colleagues) predicted that there would be specific enzymes, each dedicated to a single amino acid–the tRNA synthetases. Yowzer. Ability of strings of PIECES(#2) [amino acids] to spontaneously take on forms capable of performing (infinitely) diverse functions (protein folding and from there, structure=function). Exactly where this concept goes is arguable, but if the linear strings of amino acids did not self-assemble into 3D functioning machines, the game would never get off the ground. Conceptually, all the machinery needs to do is ‘read out’ a nucleotide sequence as an amino acid sequence and ‘let go’, and the properties of the building blocks (amino acid sides chains as well as repeating backbone elements) will spontaneously give rise to folding.